The easiest way to get started with .NET Core Lambda is to use Visual Studio 2017 and our AWS Toolkit for Visual Studio. We released version 1.14.0.0 of the toolkit today with updates to support using .NET Core 2.0 on AWS Lambda. The AWS Lambda project templates have been updated to .NET Core 2.0. You can easily deploy to Lambda by right-clicking your Lambda project and selecting Publish to AWS Lambda. 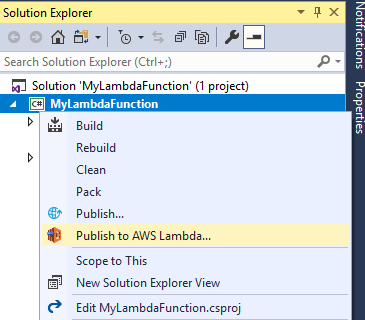 Although you can create a Lambda package bundle by zipping up the output of the dotnet publish command, we recommend that you use our dotnet CLI extension, Amazon.Lambda.Tools. Using this tool over dotnet publish enables our tooling to ensure the package bundle has all of the required files. These include the <my-project>.runtimeconfig.json file that the .NET Core 2.0 Lambda runtime requires, but which isn’t always produced by dotnet publish. The tooling also shrinks your package bundle by removing Windows-specific and macOS-specific dependencies that dotnet publish would put in the publish folder. This tool is set up by default in all of our AWS Lambda project templates because we added the following section in the project file. As part of our release today, version 2.0.0 of Amazon.Lambda.Tools was pushed to NuGet.org to add support for .NET Core 2.0. Depending on the type of project you create, you can use this extension to deploy your Lambda functions from the command line by using the dotnet lambda deploy-function command or the dotnet lambda deploy-serverless command. If you’re just building your Lambda package bundle as part of your CI system and don’t want the extension to deploy, you can use the dotnet lambda package command to produce the package bundle .zip file to pass along through your CI system. This earlier blog post has more details about our Lambda CLI extension. If you’re not using Visual Studio, you can create any of our Lambda projects using the dotnet new command by installing our Amazon.Lambda.Templates package with the following command. The ::* syntax at the end of the command indicates that the latest version should be installed. This is version 2.0.0, also released today, to update the project templates to support .NET Core 2.0. See this blog post for more details about these templates. Because the programming model hasn’t changed, it’s easy to migrate your existing .NET Core 1.0 Lambda functions to the new runtime. To migrate, you need to update the target framework of your project to netcoreapp2.0 and, optionally, update any of the dependencies for your project to the latest version. Your project probably has an aws-lambda-tools-defaults.json file, which is a JSON file of saved settings from your deployment. Update the framework property to netcoreapp2.0. If the file also contains the field function-runtime, update that to dotnetcore2.0. If you’re deploying a Lambda function as a serverless application using an AWS CloudFormation template (usually named serverless.template), update the Runtime property of any AWS::Serverless::Function or AWS::Lambda::Function AWS CloudFormation resources to dotnetcore2.0. With these changes, you should be able to simply redeploy using the new .NET Core 2.0 runtime with our AWS Toolkit for Visual Studio or dotnet CLI extension. The AWS Tools for VSTS support two tasks related to performing Lambda deployments from within your VSTS or TFS pipelines. The general-purpose AWS Lambda deployment task, which can deploy prepackaged functions that target any supported AWS Lambda runtime, has been updated in version 1.0.16 of the tools to support selection of the new dotnetcore2.0 runtime. The .NET Core-specific Lambda task, which uses the Lambda dotnet CLI extension, will operate without requiring changes to the task configuration. You just need to update the project files built by this task, as described earlier. We’re excited to see what you build with our new .NET Core runtime and to expand our .NET Core 2.0 support across AWS. Visit our GitHub repository for our .NET Core tooling and libraries for additional help with .NET Core and Lambda.